WASHINGTON (PAI)—Federal appellate judge Brett Kavanaugh’s sexual aggression—and that’s putting it politely—should keep him off the U.S. Supreme Court, the Coalition of Labor Union Women says. And they’re not the only ones. Tens of thousands of people, women and men, including almost 1,000 in D.C. on Sept. 24, poured into the streets nationwide from coast to coast to urge senators to reject President Donald Trump’s nomination of the anti-worker right-winger to the nation’s highest judicial tribunal. More demonstrations occurred Sept. 27. Whether the demonstrations and statements of victims of sexual aggression, assault, and attack will move senators to change their minds is up for grabs. Trump, Senate Majority Leader Mitch McConnell, R-Kent., and the ruling Republicans on the Judiciary Committee appear determined to, in McConnell’s words, steamroller it with a “he-said-she-said” hearing on Sept. 27, a committee vote the next day, and a Senate vote the next week. That’s despite Kavanaugh’s rampant unpopularity and opposition from CLUW, the AFL-CIO, National Nurses United, the Teachers, Jobs With Justice and civil and women’s rights groups, among others. “It is time for all senators to stand up and be counted. Dr. Ford must receive the support Anita Hill was never afforded,” CLUW President Elise Bryant said. That refers to the 1991 Judiciary Committee mistreatment of Hill’s sexual harassment allegations against then-Supreme Court nominee Clarence Thomas. “Senators already have enough information to reject this nominee. Do the right thing now,” said Bryant. Meanwhile, a second accuser, Deborah Ramirez, stepped forward in The New Yorker to detail later sexual abuse of her by Kavanaugh while both were Yale University students. Kavanaugh, she said, exposed himself to her and tried other actions, and other students identified him at that party, by name. A third woman, Julie Swetnick, came forward on Sept. 26 with a sworn deposition about Kavanaugh’s participation in “gang rapes” during his high school years. Ford’s account, days ago in The Washington Post, detailed Kavanaugh’s sexual assault on her—including getting her drunk, ripping her clothes and forcing his hand over her mouth to prevent her from screaming—while both were at a teenagers’ party during their years in exclusive D.C. area private high schools. Besides Kavanaugh’s hostility to workers in rulings, NNU Co-Presidents Jean Ross and Deborah Burger wrote senators and cited Ford’s allegations. “Any person who has committed sexual assault is unfit to serve on the Supreme Court of the United States,” they declared. When the D.C. Circuit Court of Appeals, on which Kavanaugh now sits, “upheld an OSHA safety citation against SeaWorld following the third death of an animal trainer who had been working with a killer whale, Judge Kavanaugh strongly dissented and characterized the government’s role in protecting such workers as ‘paternalistic.’” The dead trainer was female. Kavanaugh also “allowed the Department of Defense to eliminate collective bargaining rights for their workers, a gross attack on workers’ rights in this country,” they wrote. A huge share of those workers are women, too. “When women, especially those without the benefit of a large platform or connections to powerful industries, share allegations of misconduct, they do so knowing that many people will not heed their first and most basic request: Bear witness to my pain,” Jobs With Justice added. 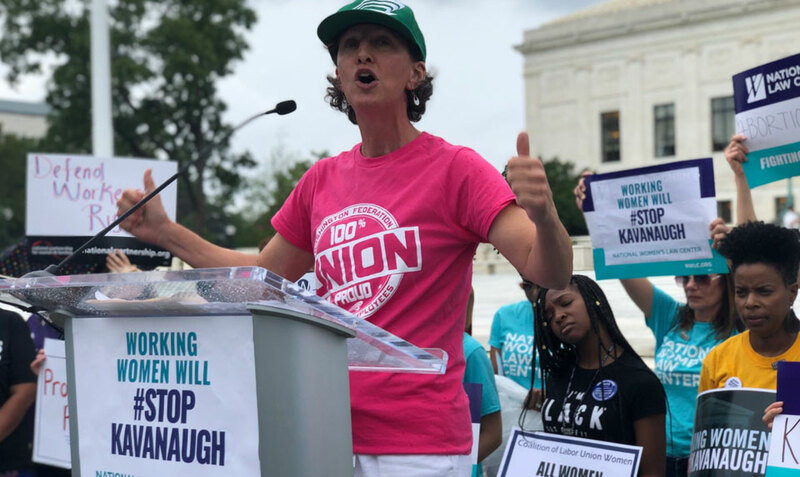 CLUW, NNU, JWJ, AFT, and the Service Employees all backed the nationwide demonstrations against Kavanaugh’s confirmation. Victims of sexual aggression led many of those events, including the one in D.C.
“All of us deserve fair treatment, and respect and recognition,” a speaker from the National Center for Combatting Domestic Violence said then. “Survivors often do not come forward” to speak of the assaults “because of retribution” or other consequences.